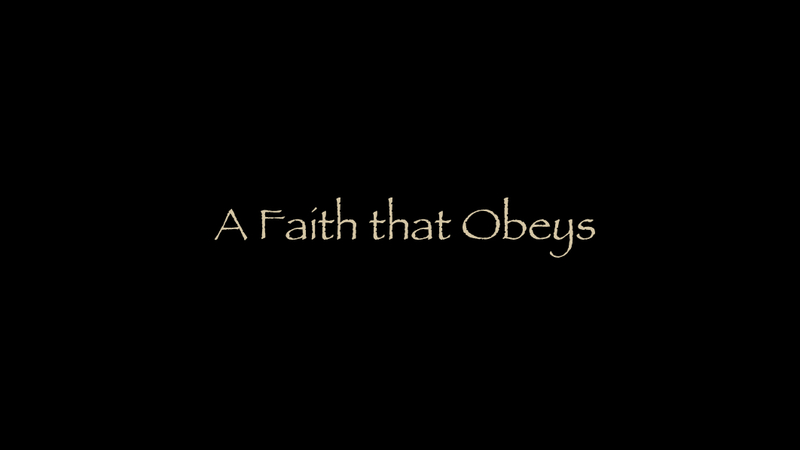 A Faith that Obeys - A Dead Religion! You know, many people believe the United States is still a Christian nation. But, I'll bet you didn't know Christianity is a dead religion! Yes. You heard that correctly. Christianity is a dead religion. And believe it or not, that's a good thing! Now, that statement might surprise you. But, what if I told you that in three minutes from now, you will not only agree with that statement but you may actually be excited about what this could mean for your own personal walk with God? As you might know, the original Bible texts were written in Hebrew and Greek. In the fourth century, a fellow named Jerome, translated the Bible into the Latin language. The Latin translation of the Bible is called the Vulgate. Latin, in Jerome's time, was the common language of the Roman Empire. Latin is such a precise language that it's still valuable today. The medical community, the legal system and many other disciplines use Latin words and phrases. It's even on our money "e pluribus unum," which means, out of many we are one. Even though Latin is such a powerful useful language, every scholar will confidently tell you "Latin is a dead language!" Obviously, this does not mean Latin is no longer used. It means, the language stopped growing nearly two thousand years ago. People stopped speaking it. Today, no one speaks Latin as their native language. All the words, the phrases, the idioms, figures of speech... it all got locked down. Nothing new was created. As a result, the latin language became sort of an ancient linguistic boundary stone which can't be moved. Words and phrases that existed back then, mean exactly the same thing today and they will mean exactly the same thing a thousand years for now. The grammar of Latin is so well established that there is no confusion as to meanings or definitions. So, Latin is a dead language and that's a good thing because... when your doctor uses a Latin phrase as he communicates with your pharmacist, the meaning is clear and you are safe! Hopefully you see where I'm going with this. The same principal is true regarding the Christian religion! When God gave us the Bible, He locked it down! The teachings, practices and doctrines of the Christian religion were clearly established and they will never change. Just as Latin is a dead language, Christianity is a dead religion. It is locked down! Now notice, I did not say, Christianity is dead. No way! Christianity is alive and well and thriving in many places. But unlike Latin, which hasn't changed, modern Christianity has been the victim of massive and destructive changes in its teachings, doctrines and practices. The Bible teaches us that Satan counterfeits Christianity. Over the years, he has been tragically effective. Think about this. There are thousands and thousands of churches in the United States. There are hundreds of denominations, claiming to follow the Bible, but they all teach different things! How can this be? If Christian doctrines, practices and teachings were locked down 2000 years ago how would something change? Well, careless people changed it! One group of Christians wanted to do something one way, another group wanted to do things another way and over time, factions developed. In essence, these probably well meaning folks ignored the "locked down" teachings which the Apostles established, and made changes to religious practices for a variety of reasons. Take a look at this scripture from First Corinthians. 1 Corinthians 1:10 - I appeal to you, brothers, in the name of our Lord Jesus Christ, that all of you agree with one another so that there may be no divisions among you and that you may be perfectly united in mind and thought. Christianity is no longer "perfectly united in mind in thought." It has given way to a wide variety of factions. Today, we call these factions denominations. Do you know that the concept of a Christian denomination is nowhere to be found in the Bible? In fact, when you consider the passage we just looked at, factions go against what the Bible teaches. The Bible speaks of only one church, the Lord's church... and that church historically follows the teachings of Jesus and the Apostles. Over the centuries, a wide range of unbiblical religious traditions have taken root. Some of these traditions are actually treated with the same authority as the Bible. What would Christianity look like if we stripped away 2000 years of candle wax and man made traditions? I can tell you from personal experience, it is "blow away" amazing and wildly different from modern evangelical Christianity! Let's be honest. If we are not practicing Christianity as described in the Bible, are we truly a Christian? Would you call someone a real plumber who does not install or fix pipes according to proper plumbing codes? Would you call someone a carpenter if they have never been taught how to work with wood? Why would we call someone a Christian if they are not following or obeying the original Biblical teachings or plans? Well, the truth is, we shouldn't and in reality, we don't! We've created new names like Baptist, Presbyterian, Pentecostal or Catholic. Have you ever wondered what happened to just being a Christian? In today's religious world, people rarely check out what the Bible says or question what their Priest or Pastor has taught them. Folks blindly follow religious practices and traditions which seem absolutely right, feel right and even seem to have solid Biblical basis; but in fact are small and sometimes large distortions of what the Bible actually teaches. Satan holds people so close to the truth, it's extremely difficult to detect his lies. Think about it. In order for a counterfeit to be effective, it must look and feel exactly like the real thing, right? Today, millions of people are fooled by a counterfeit form of Christianity. This fake is so close to the truth, so emotionally confirming and so full of joy, few people bother to check back to the boundary stone of the Bible to test, compare and challenge their beliefs. We have become like ostriches with our heads in the sand. Compounding the problem is a pervasive worldly attitude in the church which says, "Everyone's opinions or preferences are equally valid so it does not matter how you worship God. Everybody is just fine. It doesn't matter." How can that be acceptable if we are not doing what God has asked us to do? Can we practice a counterfeit form of Christianity and not have some consequence? This is a huge problem! If what I am saying is true, this counterfeiting is the most dangerous lie in modern history because of it's eternal consequences. You know, counterfeiting currency is a huge problem and the US government takes great strides to prevent it and make it harder for people to produce fake money. What if I gave you a $100.00 bill? I'd be your best friend, right? But then you took it to the bank and found out it was fake! Only an expert was able to spot the difference. Now, what if I gave you a $100.00 bill that was beautifully drawn with a green crayon... that would be lame and you would never believe it. No, in order to be believable, a counterfeit needs to be very, very convincing. This is Satan's main method of operation. He is a liar and his craft is counterfeiting! Many sincere, God fearing, God loving, well intentioned folks accept this counterfeit form of Christianity and as a result are on that road... that broad road, which leads to destruction because they have never been equipped with the information you are about to receive and so been able to carefully examine the scriptures to discover the truth for themselves. They can't distinguish the real from the fake. Think about it. If the Bible is God's word and that word presents a simple, clear, plan of salvation, shouldn't we still be following that plan, even after 2000 years? Frankly, I know of no modern denomination which holds to and teaches this Biblical plan of salvation. Honestly, this really should come as no surprise. Remember, Jesus said we should be looking for a narrow road, not that wide road that everybody else is on. You are about to see just how narrow the road really is and it will absolutely shock you! In the next few videos, I want to show you this Biblical plan of salvation... a plan that is so simple and so easy to understand that even a child can understand it. Yet, believe it or not, it is absolutely missed... or rejected... by even our best Biblical scholars. It's a Biblical secret that's hiding in plain sight which you can easily learn and follow, if you have a heart that is willing to listen. Jesus said, we must have the heart of a child! And, as you may know, it's the heart of a child that the teachers and scholars of Jesus day were missing. It's no different today. Matthew 11:25 At that time Jesus said, I praise you, Father, Lord of heaven and earth, because you have hidden these things from the wise and learned, and revealed them to little children. Well, thanks for watching. I have a lot more to share with you but, at this point, I've gotta provide a warning. The material you are about to see is so controversial and so challenging, it would be really detrimental to your spiritual well being if you don't approach this with the right heart. The apostle Peter said it would be better for you not to know what you are about to learn than to learn it and not obey it. In all likelihood, as you watch the next few videos, you are going to discover that you are doing some religious things wrong or have fallen victim to Satan's counterfeit. How will you respond if you discover you are wrong? Will you get mad? Will you debate? Will you be apathetic? Or will you have that child-like heart that says, "I am open to the possibility that I could be wrong." It is God who has brought you to this point in your spiritual journey. It is no accident that you discovered this video. It is God who has patiently, gently led you to this exact time in your life, when you can hear something you have never heard before and as a result, experience a relationship with Him, which you have never known because you did not have the information you are about to learn. If you made a sincere decision to follow Christ, even many years ago, do you think God is finished teaching you new things? Do you still have a soft enough heart, which will humbly respond to His Spirit calling you to make radical new changes? What do you have to loose? If you truly love God don't you think He wants you to take it higher? Now, on the other end of the spectrum, if you feel like you are being hammared by trial after trial in your life and it seems like God is absolutely absent... these lessons may provide a critical missing piece of the puzzle and give you the hope that you really can have "life to the full". You don't have to continue living in spiritual frustration. What we are about to do is let the scriptures speak. What you are about to see is not my opinion or some religious organizations opinion. We will use the scriptures and the scriptures only and let them be our guide. We will use logic and reason as we pursue this "secret hidden in plain sight." Let me present my case and you decide if it makes sense. As always, it is up to you to carefully evaluate and pray about the things you learn. It has always been and will always be your relationship with God and your decision as to how you will follow him. So, if we are using the Bible and praying for insight, why would God not honor our request to grow and learn more about His mysterious ways? I believe it is possible to return to a form of Christianity as described in the Bible by simply following the plan which was established 2000 years ago. That Plan has never changed. Your denominational minister or pastor does not follow or understand this plan, and even if they did, they can not teach it. They must do what the hierarchy of their denomination tells them to do or they will lose their position. Frankly, given the choice between losing my position or following God's will, I will always choose God's will as revealed in the Bible. Somehow, I think God has a really special way of blessing people who are willing to obey His word with all their heart especially when the risk is great. Don't you see? God is tapping you on the shoulder. It's time to do something great! He is laying an opportunity at your door-step which may just be the answer you have been looking for. Are you ready? I pray that you are open, humble and ready to learn some amazing OLD things. Be prepared to take your life with God to a level you never thought possible. In the next video, let's prepare a great foundation for our lessons. Let's do the important, and just a little bit tedious work of establishing some basic grammar. I promise you, even a lesson on grammar may be quite eye opening! Well, buckle-up and let's get growing... and by the way... Welcome to a Faith that Obeys!